The Urban Nomads: All Hail The Mighty Ra! To be clear, all hail Ra, the Egyptian god of the sun, not Ra the Goa’uld System Lord (Yes, that was a Stargate reference). Seriously, though, my solar system is working well. So, I went to work yesterday with Wanda’s batteries at 71% charge and I was curious to know how the new solar charging system would fair. What level of charge would be in the batteries when I got home? In essence, was this large expense a huge waste of money and hope? Well, I came home to find that the charge was at . . .
Yep, that’s right 100% charge! 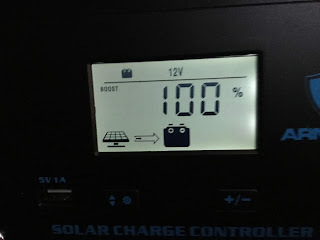 This means that I can actually enjoy electricity and have the sun charge Wanda’s batteries up while I am at work. I know that there will be overcast and grey days, so there will be evenings and mornings of me using no power at all. Me conserving energy and using no power out of Wanda’s Batteries is not exactly a new concept to me. It is for this reason that I have not gotten rid of any of my battery powered devices. (Radio, flashlights, etc). I am just thankful that I can use electricity and not have to worry about having to run my generator again. I also know that at some point I will buy another generator, as it is prudent to have one, just in case. For now, I am just enjoying not having one, and not having to run one.